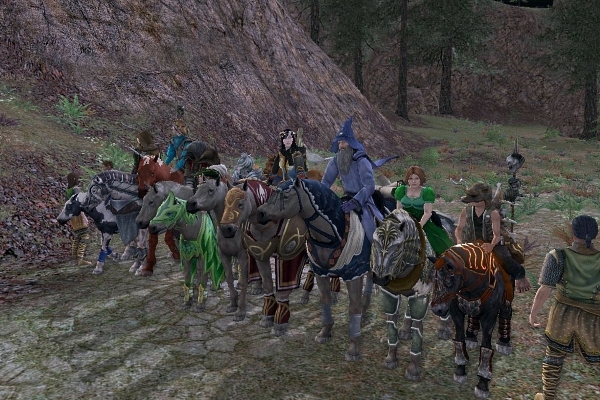 Ten racers with well-bred steeds registered — Amenhir on Anders, Ayelbourne on his war steed, Endoner on Lorebearer, Kikilaa on Sweetleaf, Ragnora on Fauchelevent, Rhunt on his “little pony”, Turkay on Mist, Umpo on Nimbus, and Lapucelle and Hologro both on horses named Keely. The well-dressed band entertained the equestrian fans while Kiralynn went over the race rules with the riders and led a pace lap of the challenging course. The music was high quality and the songs were very popular. Several groups began coordinated dances while others launched fireworks during breaks to show their appreciation. Today’s course was the same as the Rivendell Cup qualifier race of the Spring Racing Carnival. 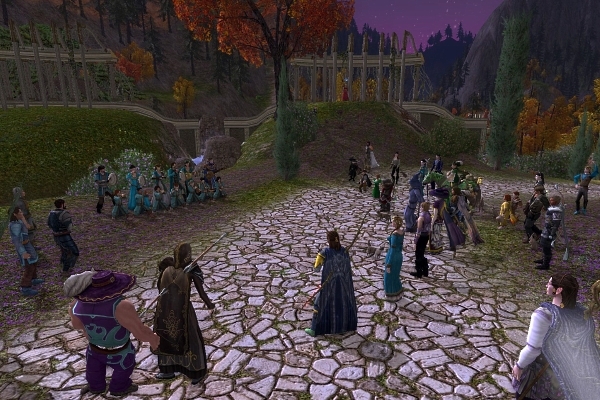 The course begins at the entrance to Rivendell valley. The start is an imaginary line between the two guards. The first checkpoint is crossing the log bridge just west of the guest house, heading north. The second checkpoint is crossing the bridge just south of the market, heading east. The third checkpoint is passing north through the arch behind the house near the stables. The fourth checkpoint is passing south through the arch on the road leading to the Misty Mountains. The fifth checkpoint is the southern bridge leading to the Last Homely House, which must be crossed heading east. The finish is an imaginary line between the statue of Gil-Galad and a cedar tree on the other side of the road. The switchback road leading from the Gates of Imladris down into the valley is difficult to maneuver with a swift but heavy war steed. Several riders fell back early in the race when their horses slipped on the path and sprained a leg. At the first fork in the road, the riders turned left to gallop toward the guest house with Umpo in a three-length lead. The marketplace was the next real challenge. Riders split up to take three different paths between the buildings to head for the bridge leading to the stables. Amenhir gained ground while Kikilaa’s veteran horse stumbled on the cobblestones and fell. At the finish line, the lead horses were neck and neck. The exuberant crowd was nearly drown out as the sky filled with fireworks. Endoner brought Lorebearer across by line first by a head, followed by Ragnora with Lapucelle only a few lengths behind in third. With much encouragement from fellow riders, Kikilaa eventually coaxed her steed to the finish, showing great determination in the face of unexpected adversity. As the race ended, a brilliant concert began. The night sky twinkled with stars and light beamed through every glass window in the Last Homely House, creating a beautiful backdrop. Many thanks to Bright Star for skipping their regular concert to entertain everyone. 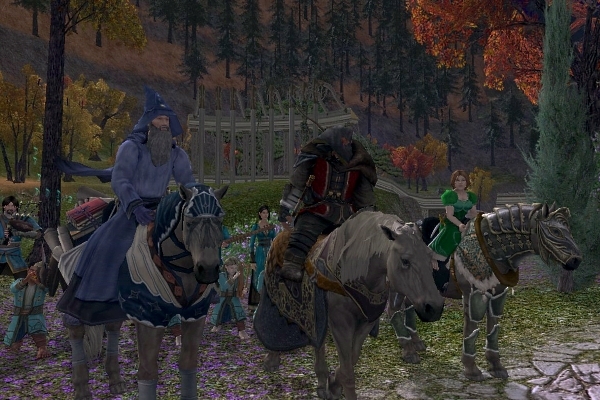 Special thanks to our race course judges — Byrcha, Caiyyd, Ethh, Ijnar, and Lhinnthel. Racing wouldn’t be possible without these fine volunteers. Our next event is the Solve-a-Mystery roleplay contest, Halloween costume contest, and charity auction scheduled for Saturday, October 24 from 4:00pm to 7:00pm EDT/servertime on Landroval. 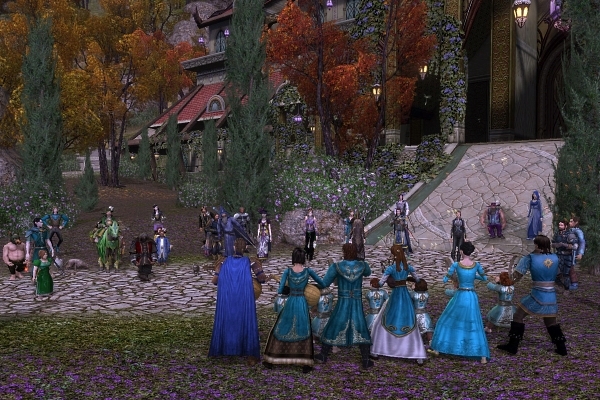 Meet at Windy Acres Ranch, 9 Chestnut Street, Raglan, Bree-land homesteads. Thank you for reading and we hope to see you at the races! This entry was posted in Horse Races. Bookmark the permalink.